Imagine equipment big enough to make you step back and squint up at the sky in order to take it all in. That was the scene at OPPD’s Nebraska City Station where emissions control work is being done on Unit 1. 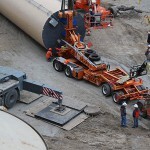 Stohlmann’s inner child was visible when he was at the plant overseeing the installation of three large storage silos. 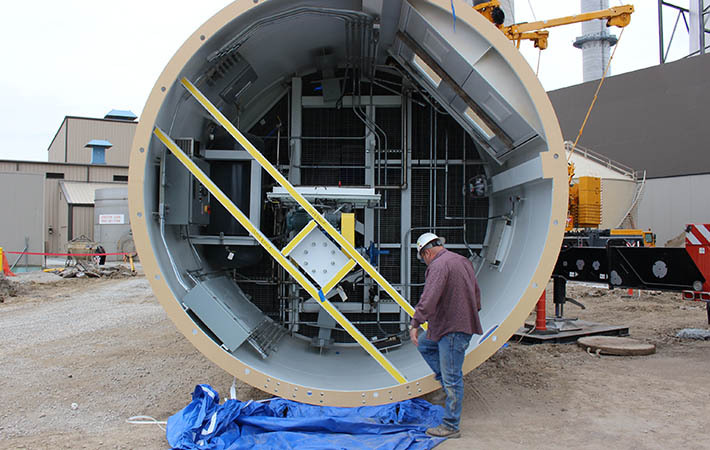 Big projects like this – OPPD’s dry sorbent and activated carbon injection project – call for big tools. Looking inside the silos while they are resting prior to erection. Oversized bolts and tools, flatbed trailers and the silos themselves – 105 feet tall – took up plenty of space at the construction site. The crane was a 600-ton-capacity beast used to erect the storage silos in a project that will have a big impact on our environment. One smaller silo had already been erected. Stohlmann, the project manager, said crews battled rain in the weeks leading up to the silos being erected. Extra dirt was brought in and stamped down to support the crane as it lifted and set the three silos into place. Along with the three storage silos at NCS, four silos will be erected at North Omaha Station (NOS). The cost of the entire project is $35 million. The silos are part of OPPD’s compliance with the Mercury and Air Toxics Standards (MATS) rule for 2016. 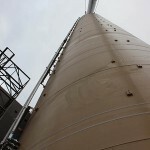 The silos will hold the dry sorbent and the activated carbon that will be injected into the plant’s flue gas streams. For the dry sorbent, a powdered sodium, either sodium bicarbonate (baking soda) or Trona, is injected. It chemically reacts with acid gasses present in the flue gas, creating particles that are removed by the plant’s electrostatic precipitator. For the activated carbon, mercury binds to the surface of the injected powdered carbon. It is then removed by the electrostatic precipitator. Testing done at both plants has confirmed the injection process will reduce acid gases and mercury emissions below the limits established by the Boiler MATS rule. 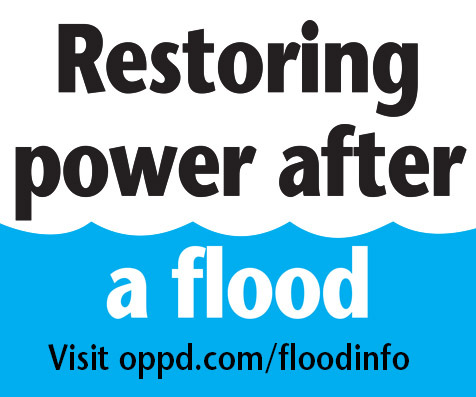 Bryan Lorence, lead environmental specialist and a member of OPPD’s MATS committee, said OPPD employees will continue to maintain and monitor the systems. 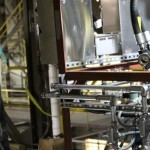 The monitoring will ensure the systems are in compliance even after the initial testing. 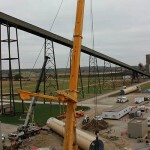 The silo erection schedule at NCS sped up due to weather and other projects commitments for the contractor. Stohlmann said the project has been successful and the construction should be done in December. 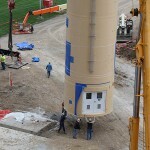 Personnel position the silo prior to erection at Nebraska City Station. The silos were approximately 105 feet tall. A crane with a 600-ton capacity prepares to lift one of the silos. Standing on the ground looking up at one of the silos puts its size into perspective. Crews prepare the inside of the plant for the dry sorbent and activated carbon injection project. The splitter skid will be used in the injection process. 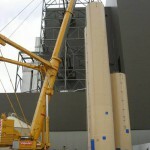 The crane positions one of the silos at the plant. 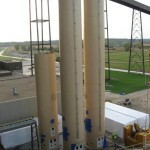 The three silos erected and ready for work at Nebraska City Station. Jason, this was a good story! I like the use of the word “beast” to describe the crane. I also like how you described Mr. Stohlman’s enthusiasm for the project (inner kid). And, I have a clearer understanding of the use of dry sorbent materials to cut down on the pollutants being released.